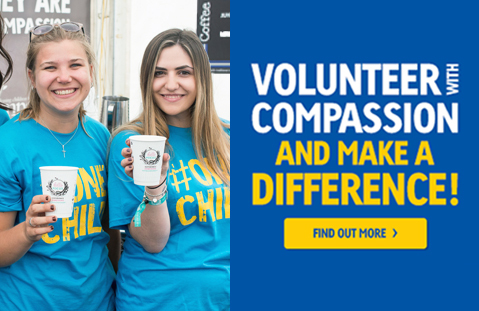 If you’re looking for charity jobs in the UK, we’d love you to join the Compassion UK team. Working for Compassion is so much more than a job. You can use your passion and talents to make a difference to some of the world’s most vulnerable children. Whether you’re searching for Christian jobs, fundraising jobs or more, we may have the position for you. We’re a growing organisation so if you can’t see a role that fits your skills, please check again on a regular basis. You can only apply if you already have permission to work in the UK. For more information or advice, call our HR department on 01932 836496 or email HR@compassionuk.org. Why work for a charity? It can be difficult to find a fulfilling job. You want to use your skills to make a difference, but it’s hard to know where to start. That’s why we want to give you the opportunity to work for Compassion, a leading children’s charity. Working for a charity is so rewarding. Every day at Compassion you’ll see the difference it makes when someone decides to sponsor a child. Here at Compassion UK we’re a collaborate, effective, joyful, grace-filled, passionate and authentic team. We have an innovative and fun team environment as we unite in a joint purpose to release children from poverty in Jesus’ name. Compassion UK is based in Fleet, Hampshire – located just 40 minutes outside of London by train. It’s an exciting time to find a children’s charity job with Compassion as we continue to grow and expand to reach more children in poverty. Join our fun and dedicated Engagement Centre team and help release children from poverty in Jesus’ name. Core+Flexi hours up to 35 pw. Closes 12th November. Use your telephone skills to help Christian charity Compassion UK release children from poverty in Jesus’ name. Minimum contract 14 hours per week up to full time. Closes 14th November. Be part of a movement that sees children released from poverty in Jesus’ name. Use your skills and experience to make a real and lasting difference. Closes 15th November. Sack loads of letters and cards for Compassion sponsored children arrive with every post! They speak words of love and hope into the lives of children around the world. We need your help to send these precious communications on their way.